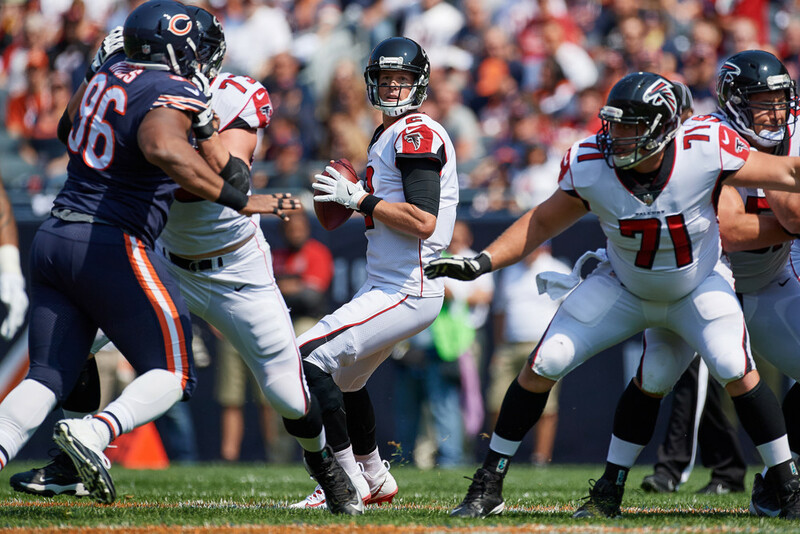 This Sunday night at 7:30 pm (CT) the Green Bay Packers will visit the Atlanta Falcons. Both teams are coming off low scoring victories in Week 1, which may come as a surprise since they both have high powered offenses. These two teams met twice in Atlanta last year (one regular season and one playoff game) and both times the Falcons came out victorious. Both games each scored 65 combined points, so this week we should see another high scoring game. High scoring means a lot of fantasy potential, so let’s look at some of the players who should benefit the most. Aaron Rodgers threw for a combined 533 yards and 7 touchdowns (1 interception) in two games in Atlanta last season. Rodgers didn’t really have Ty Montgomery as a pass catching running back, and with the addition of TE Martellus Bennett, Rodgers should actually have more weapons to throw to. Rodgers is an obvious fantasy start and should easily be a QB1 this week. Ty Montgomery had 19 carries for 54 yards and 1 touchdown in Week 1 against a strong Seattle defense. He also caught all 4 of his targets for 39 yards. The Falcons held the Packers to ~100 yards rushing both games last season, so Ty might be in for a long game in Atlanta. He should still be a viable fantasy option, especially in PPR. Look for him to be a solid RB2 option in both standard and PPR leagues. The Falcons held Jordy Nelson pretty much in check last season, allowing 94 yards in the regular season and 67 yards in the playoffs. Jordy caught a touchdown in each game, so look for him to continue the trend. He is still Rodgers most trusted receiver. If this game is indeed a shootout, Nelson should land as a WR1. Randall Cobb led Packers’ receivers in Week 1 with 13 targets. Atlanta’s pass defense isn’t anything special, so with this game looking to be an offensive battle, Cobb should see his fair share of targets again. Cobb is a lower end WR2/Flex option until we see this target number become a pattern. Matt Ryan had a career year last year, running over the Packers’ defense for a combined 680 passing yards and 7 touchdowns. Ryan will probably regress to his mean a bit this year, but he should be throwing a lot in this game. Beware though that the Packers’ defense looked good against Seattle, and if it stays that way, Ryan will most likely be a lower end QB1 based on volume. He’s Julio Jones. He is a stud. You are going to play him. The Packers pass defense hasn’t been great the last few years, so Julio should get a lion share of targets. He should be played like a WR1. Mohamed Sanu had 9 targets in Week 1, more than any other Atlanta Falcon. With the Green Bay pass defense being uncertain as mentioned above, he should see plenty of targets as well. Look for Sanu to be a lower end WR2/Flex option. The Packers actually had one of the best run defenses in the NFL last season, and Devonta Freeman was a victim of solid defensive line play. In the two games against the Packers last season, Freeman rushed for a combined 77 yards and 1 touchdown. He had better success through the air and caught a touchdown in each of the two games. He was drafted to be a starter, so he will be in your lineup and should end up a RB1 if he continues his touchdown trend. Tevin Coleman only played vs the Packers in the playoffs, and struggled just as much as Freeman did. He did catch 3 passes for 35 yards, but his fantasy day was saved by running one in for a touchdown from 3 yards out. Coleman is a shaky flex play, and should only be considered in PPR leagues. Coleman is more of a flex option in this game, but should see plenty of targets, so play him if you are strapped by injury.